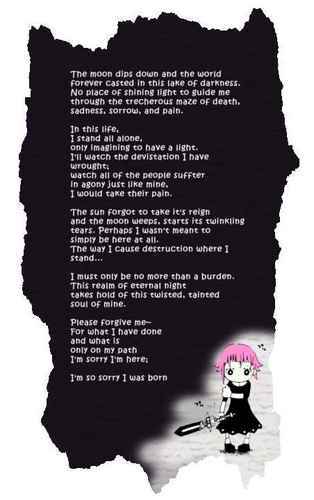 crona poem. crona's poem from episode 26. Wallpaper and background images in the Soul Eater club tagged: soul eater cool cute pics crona poem. oh so this was what she wrote...cool. lol. everyone is apologising now. *cries* YYYYYYYY SO SAD i needs hug FROM CRONA!!!!!!! Now before all of you haters out there start hating on me. I would like to point out that the fragment of humanity that makes me feels sympathy for others died, so to me this is f**king funny as f**k.